This assay has high sensitivity and excellent specificity for detection of human PLD1. No significant cross-reactivity or interference between human PLD1 and analogues was observed. The minimum detectable dose of human PLD1 is typically less than 6.25 pg/ml. The sensitivity of this assay, or Lower Limit of Detection (LLD) was defined as the lowest protein concentration that could be differentiated from zero. It was determined the mean O.D value of 20 replicates of the zero standard added by their three standard deviations. Small volumes of PLD1 elisa kit vial(s) may occasionally become entrapped in the seal of the product vial during shipment and storage. If necessary, briefly centrifuge the vial on a tabletop centrifuge to dislodge any liquid in the container`s cap. Certain products may require to ship with dry ice and additional dry ice fee may apply. MBS914961 is a ready-to-use microwell, strip plate ELISA (enzyme-linked immunosorbent assay) Kit for analyzing the presence of the phospholipase D1, phosphatidylcholine-specific (PLD1) ELISA Kit target analytes in biological samples. 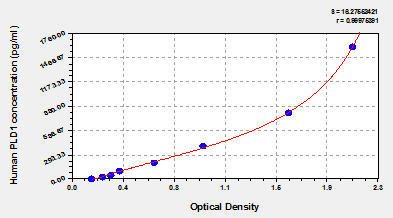 The concentration gradients of the kit standards or positive controls render a theoretical kit detection range in biological research samples containing PLD1. The ELISA analytical biochemical technique of the MBS914961 kit is based on PLD1 antibody-PLD1 antigen interactions (immunosorbency) and an HRP colorimetric detection system to detect PLD1 antigen targets in samples. The ELISA Kit is designed to detect native, not recombinant, PLD1. Appropriate sample types may include undiluted body fluids and/or tissue homogenates, secretions. Quality control assays assessing reproducibility identified the intra-assay CV (%) and inter-assay CV(%). Principle of the assay: This assay employs the quantitative sandwich enzyme immunoassay technique. Antibody specific for PLD1 has been pre-coated onto a microplate. Standards and samples are pipetted into the wells and any PLD1 present is bound by the immobilized antibody. After removing any unbound substances, a biotin-conjugated antibody specific for PLD1 is added to the wells. After washing, avidin conjugated Horseradish Peroxidase (HRP) is added to the wells. Following a wash to remove any unbound avidin-enzyme reagent, a substrate solution is added to the wells and color develops in proportion to the amount of PLD1 bound in the initial step. The color development is stopped and the intensity of the color is measured. NCBI/Uniprot data below describe general gene information for PLD1. It may not necessarily be applicable to this product. PLD1: a phosphatidylcholine-hydrolyzing phospholipase. Activated by ADP-ribosylated Rho and protein kinase C. Implicated as a critical step in numerous cellular pathways including membrane trafficking and the regulation polymorphonuclear leukocyte degranulation and oxidant production. May be involved in the regulation of perinuclear intravesicular membrane traffic. Four splice-variant isoforms have been described. 1. This data indicates that CAY10593 impairs human P2X7 independently of PLD1 stimulation and highlights the importance of ensuring that compounds used in signalling studies downstream of P2X7 activation do not affect the receptor itself.